Q. I always hear that walnuts are great for their Omega-3 levels, but I've also heard the ratio of Omega3 to Omega6 is also very important in one's diet. And walnuts' ratio of Omega3 to Omega6 doesn't seem that great, so I am confused. Monica's Response: Walnuts contain the most omega-3 fats of any nuts. An ounce of English walnuts contains about 2.5 grams of omega-3 fats, which is about twice the suggested Daily Value for omega-3. But, you're right: current thinking is that the ratio of omega-6 to omega-3 fats is at least as important as the absolute intake. For most people, the challenge is to decrease omega-6 and/or increase omega-3 to approach a 4:1 ratio (four times as much omega-6 as omega-3). Some people think you should aim for 2:1 or even 1:1. Given that the average ratio in the Western diet is around 20:1, I think that getting it down to 4:1 would be a big improvement! While walnuts are a good source of omega-3, they are a better source of omega-6. An ounce contains about 10g of omega-6 for a ratio of 4:1. If walnuts are the only source of omega 3 in your diet, then 4:1 is as low as you'll be able to get that ratio--and that assumes no other sources of omega-6. To decrease that ratio further, you'd need to add other sources of omega-3 (without increasing omega-6). 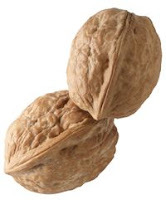 0 Response to "Walnuts: High in Omega-3 but..."